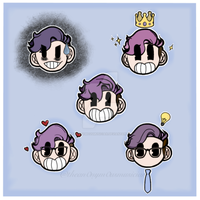 My first ever fanart of the always wonderful Thomas Sanders as his persona's Anxiety and Princey (Yes I do know their names). OMG! this is my wallpaper for my phone! (I hope that's okay) I love it so much! go prinxiety/Virgan! Aww! Such beautiful piece of art! I love everything about this! I watched to speed-art to this on youtube. I didn't know it was here! Oh my god this is so amazing! I love it so much I barely have words. AHH THIS IS SO GOOD! I saw the WIP sketch of this on Tumblr and was really excited to see the final! Gods, I love the Sanders Sides so much~.